Less than ten miles south of Guadeloupe lies a small grouping of eight tiny islands known as "The Saints." 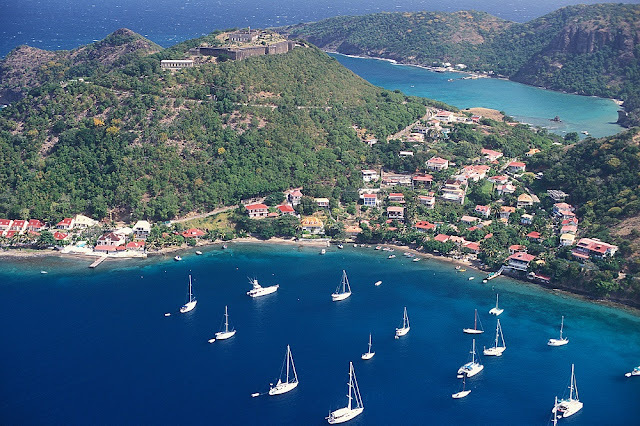 The Îles des Saintes ("Islands of the Saints"), also known as Les Saintes, is a small archipelago of the French Antilles located to the south of Basse-Terre Island, west of Marie-Galante and north of Dominica. It is a dependency of Guadeloupe, which, in turn, is an overseas department and region of France. They are distinctively French and picture postcard Caribbean! 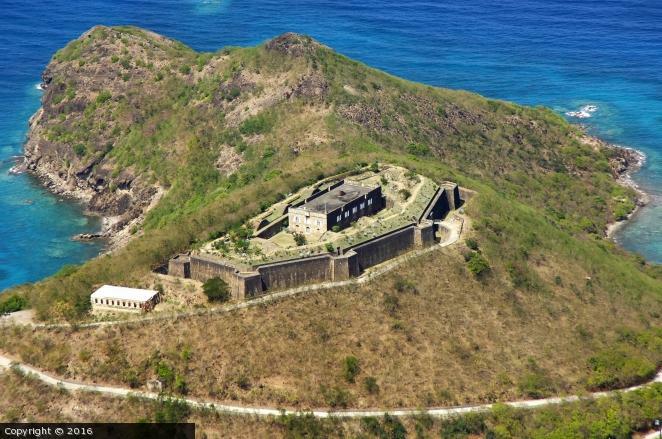 A lot of people say it's what St. Barths was like before it became a tourist destiantion and commercialized. 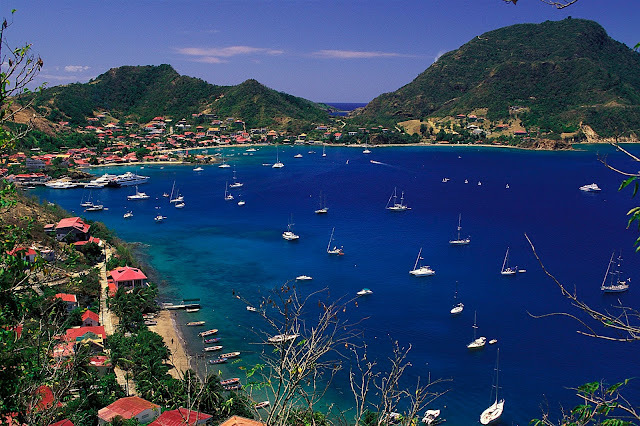 We had a great cruise there from Guadeloupe that left Brad elated..
Les Saintes is a volcanic archipelago fully encircled by shallow reefs. It arose from the recent volcanic belt of the Lesser Antilles from the Pliocene Epoch. It is composed of rocks appeared on the Tertiary age between (4.7 to 2 million years ago). By origin, it was a unique island that the Tectonic and Volcanic earthquakes separate to create an archipelago due to the subduction zone between the South American plate, the North American plate and the Caribbean plate. until they "cleared" us into their country. and to check out the sights. We were here for 2 days. As we pulled up at the dingy dock, we noticed that all of the dings were locked to the dock. Was there stranger danger afoot? We got the once over from a few passerby's..
Brad & Bish happily ignored them. Charm and more charm on this little island. The walk through town was as cute as can be..
We found a quaint French place for dinner. I say "French place" like there's a choice for something else. ha! not. headed back to the boat to watch a movie. There was some heavy rain we had to wait out until it passed. and were off to explore the rest of the island and its beaches. 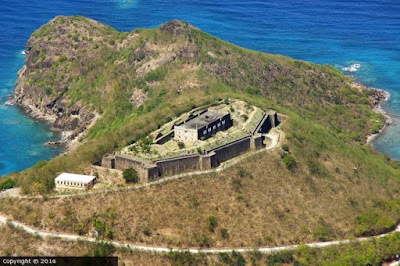 Fort Napoleon was a highlight and so well preserved. One of the best forts we've ever seen. A moat filled with wheat...photographic perfection. back to Napoleon on my moms side of the fam. The boys decided they needed to toughen up and show off their bad boy side..
We spotted this funky restaurant in the shape of a ship. Love all the colors of the Caribbean! The line at the local ice cream shop was intense..it was HOT as anything out! There's always a quaint old church in every town. Catholicism is the prevalent religion here. Some fishermen I spotted sitting on the shore mending their nets. Such a slice of life. One of their boats beachside. Shameless selfie to commemorate our day. As we walked further through the neighborhoods, we spotted this little pool? Who knows what was going on there...We weren't going to hang & find out. Sunset was perfection and the best way to call it a day...but first a swim.